NO COMPUTER CLASSES TUESDAY, NOVEMBER 28 OR THURSDAY, NOVEMBER 30 DUE TO NO REGISTRATIONS. SALE OF COOKBOOKS DONATED BY THE FAMILY OF BETTY CHAFFEE THROUGH THE MONTH OF DECEMBER. PLEASE CHECK IN ON FACEBOOK WHEN YOU ARE VISITING THE LIBRARY. Use this link to access your account, renew materials, or place holds on desired materials. ANCESTRY LIBRARY EDITION NOW AVAILABLE FOR USE IN THE LIBRARY! 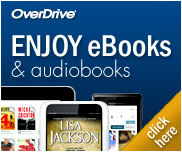 Download audiobooks and eBooks to your personal devices through our library system for free! IF YOU CAN'T ACCESS YOUR ACCOUNT, PLEASE CALL THE LIBRARY. YOU MAY SIMPLY NEED YOUR CARD RENEWED.